Democratic Republic of the Congo (also known as DRC, but not to be confused with neighboring Republic of the Congo) is an interesting origin, just barely on the radar of specialty coffee. A long and established Robusta economy has been more prevalent in the coffee sector, and an emphasis on high-quality Arabica coffee is just gaining a foothold among producers. The country itself is the fourth most-heavily populated on the continent, and is the second-largest nation in Africa as well. Despite the population, however, resources such as roads, potable water, and electricity are scarce, and development within agrobusiness has been slow. Until 1976, the national regulatory authority, Office National du Café (ONC) held a monopoly on the coffee-export market; liberalization and the elimination of price controls in the early 1980s created both opportunity and some chaos as the market equalized to determine pricing levels and structure. Similarly, the transition from a primarily plantation-based coffee-farming industry to one comprising thousands of smallholder farms was a somewhat difficult time for producers, as they struggled to gain a foothold in the market and to manage their own land and operations in a country that is still very much dominated by rural agriculture. Access to the market is exceptionally difficult, and political and economic unrest over the past few decades has made specialty-coffee growing and sourcing a challenge, but projects, organizations, and cooperatives such as SOPACDI are actively working to improve networks and infrastructure to bring top-quality lots to the international market. Coffee is grown in most of the country, spread throughout its seven provinces, and is a significant cash crop, though most of what is grown and exported is either full Robusta or not specialty-quality. Investment projects and direct-sourcing projects are contributing to a general increase in profile and availability of better coffees, however, and the next few years looks very hopeful for Congolese coffees. We love coffees from the growing regions around Lake Kivu—Burundi, Rwanda, and Democratic Republic of Congo. We find that despite the relatively close geographical area, the lake and its surrounding landscape has an incredible diversity of microclimate and profile. 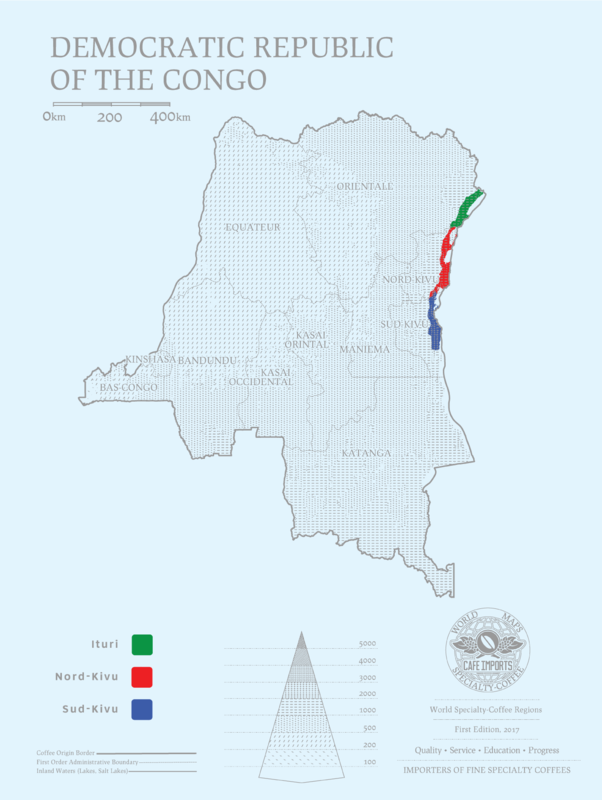 As a result, Congolese coffees are distinct, and among our favorites, from this area of the world. Cafe Imports has partnered with SOPACDI (Solidarité Paysanne pour la Promotion des Actions Café et Development Intégral), an organization of nearly 6,000 smallholder farmers, founded by Joachim Munganga in 2002. Joachim is a farmer himself, and recognized the need that other smallholders have for market access and technology that would help them improve quality. Every year, the lots we buy from SOPACDI are standouts on our offerings sheet, and we have been able to source more and more coffee from them every year, with an eye toward a future of microlots and other projects for quality development.